Combing contemporary and retrospective artists could always be controversial and disastrous, but in the right hands, it could equally prove inviting. The concept was innovate for its time, but received low sales and mixed reviews. 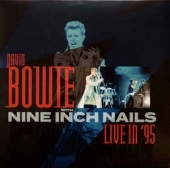 In 1995, Nine Inch Nails co-headlined the 'Dissonance' tour with David Bowie as part of their 'Self Destruct Touring Cycle'. For Bowie, he was promoting his latest album OUTSIDE while returning to a territory that recalled his cherished 'Berlin' period. Back with Brian Eno and riding high with The Hearts Filthy Lesson, his 1995 collaboration with new industrial gods NIN was both brave, and rewarding for all. Protus proudly presents a priced selection of performances with NIN during his 1995 USA tour. Professionally remastered original Nationwide/KLLT-FM radio broadcasts with background liners and rare photos.